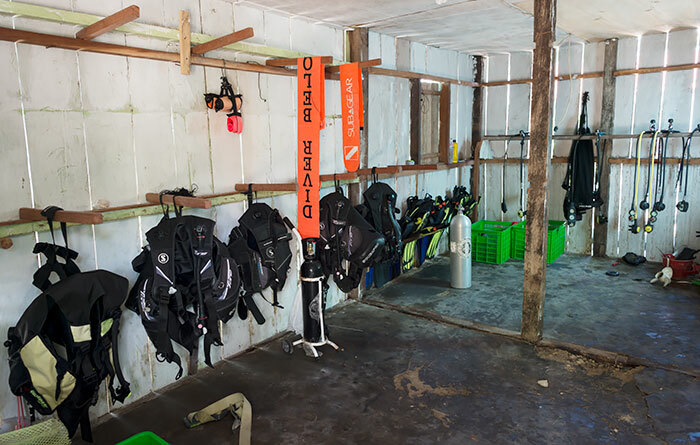 Arborek Dive Shop is owned by Marsel Mambrasar and Githa Anathasia, both of whom hold PADI Rescue Diver certification and have extensive Raja Ampat dive guiding experience. 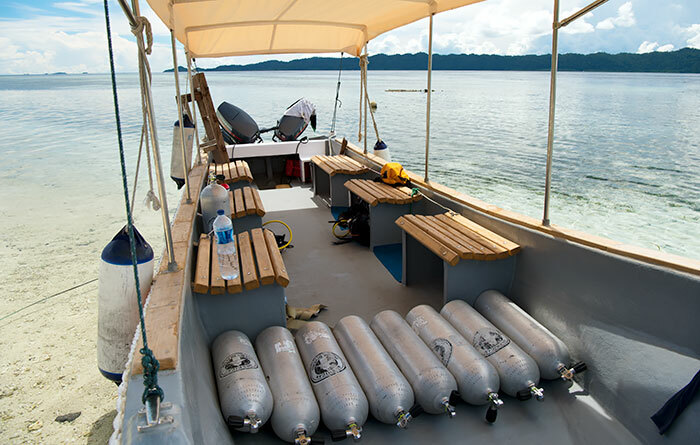 Guests at all Pulau Arborek Homestays are welcome to dive with Arborek Dive Shop’s experienced local team. 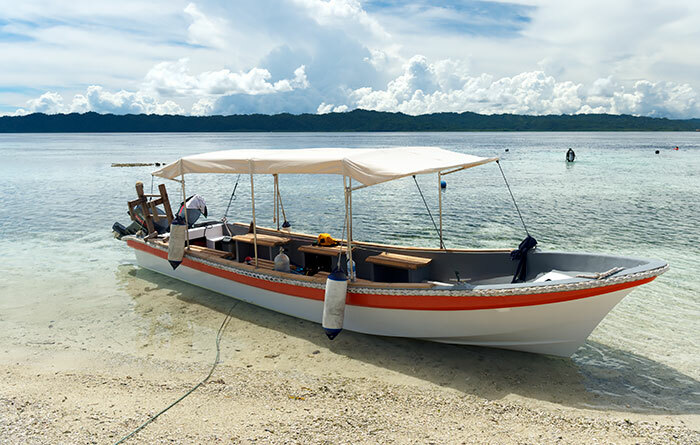 Pickups can also be organised from Waisai or other Raja Ampat homestays – the price will depend on distance. Contact Arborek Dive Shop by one of the methods listed below for more info. 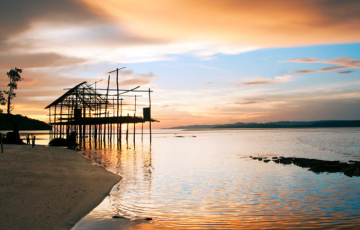 In addition to its fabulous local dive sites, Pulau Arborek also offers the closest accommodation available to the famed Manta Sandy and Manta Point dive sites. 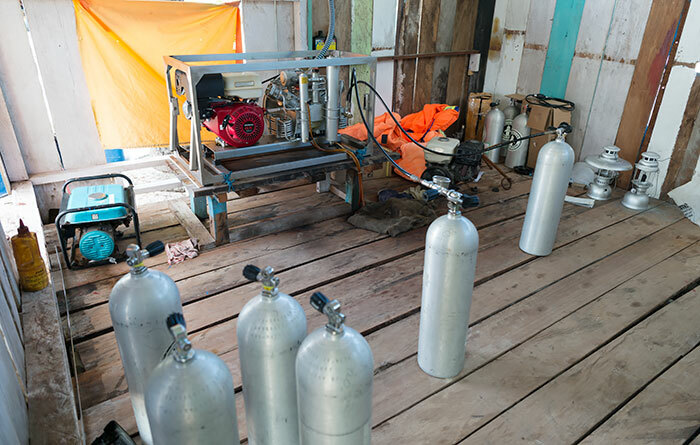 Arborek Dive Shop can of course also organise dives at any Raja Ampat site you want to visit – including some of their own “secret” sites that you’ll have all to yourself! Check out the “Dive Sites” tab on their page linked above for more. 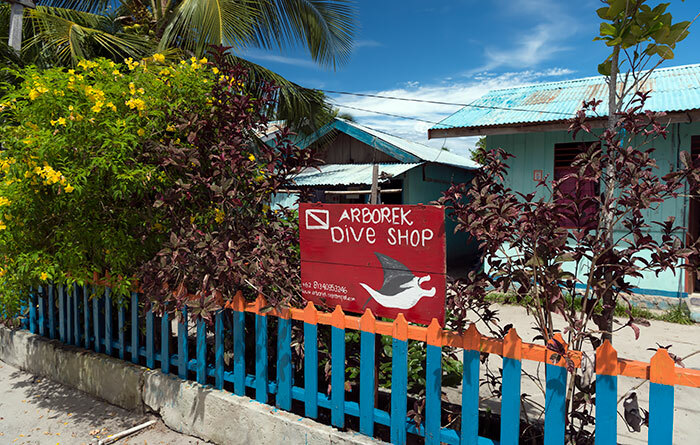 For non-divers, Arborek Dive Shop offers sightseeing and snorkelling trips to various locations and snorkelling equipment is available for hire if you just want to check out the local sights. 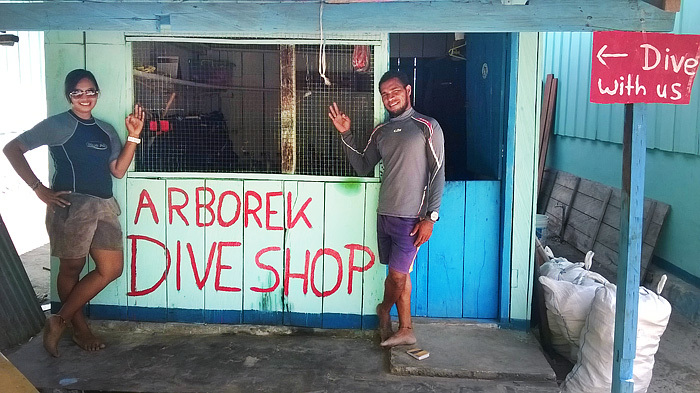 Arborek Dive Shop actively supports local community development work, providing English classes for both children and local business people. The business is also active in the local Crown of Thorns starfish control program, with 3 CoT injection kits and regular starfish removal patrols. Arborek Dive Shop also sells refillable water bottles and refills are always available there. Arborek Dive Shop is easy to find, being visible from both the jetty and beach (see the map below). 26 Tanks, 18 sets of Masks, Snorkel & Fins, Booties, Weight Belts, 8 sets of BCD, Regulators & Octopus, plus a limited range of wet suits. Prices below are in Indonesian Rupiah for Arborek homestay guests and are all inclusive of guide, diving equipment rental, drinking water and boat hire. Prices do not include hire of dive computers. You can pay in cash, or by credit card, bank transfer or Paypal. A round trip from Waisai to Arborek and back will cost IDR 3,000,000. The trip is by twin 40HP powered speedboat, can accommodate up to 8 people and the price is shared by passengers. Super good dive guides and a lot of personal care! Githa and Marsel are two amazing dive guides, who are both very enthousiast under water and on the surface. They see all the big and small stuff. Marsel showed us nudibranches, which we saw for the first time! Also they took really good care of us as we are still beginning divers and did not have a dive computer. With them we also dared to go to the more difficult dive sites, as there can be strong currents in Raja Ampat. In total we did 8 dives with them and went even on a trip to Pianemo (for a really fair price). We had a really good time and could not be wishing for a better experience. Thanks guys! My girlfriend and I dove with the Arborek Dive Shop in February and we appreciated it very much. First of all, I have to mention the friendliness of Githa, Marcel, River and all the staff. Amazing people in an amazing place, what could the people want more ? I booked our diving session months ago. But on showing up the first day, I felt some pain in my ear (be very very careful with ear infections in RA). Githa and River went out of their way to book a doctor’s appointment for me in Sorong, she also provided us with a driver/translator in Sorong. This was very very helpful because we were a bit lost there. On our return, and because we lost 3 diving days, Githa agreed to extend our bookings (sessions were available). Because Githa was diving with another group, we dove with River, an instructor who was lending a hand to Githa for some weeks. HUGE thanks to him for all his patience and advices. We were (are ?) baby divers and he took it into account, he was constantly checking up on us. Also, his tremendous experience in diving and his mastery of French, English and Dutch were of huge help to everybody. We couldn’t recommend him enough. 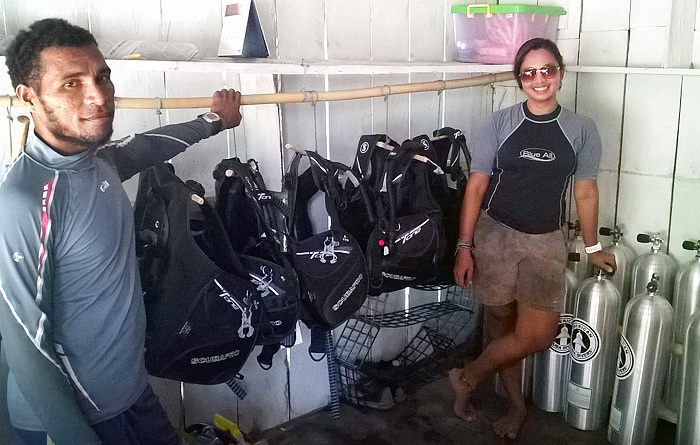 I would like to take some lines to acknowledge the tremendous job Githa and Marcel has done to build the Dive Shop. It must be very difficult to acquire diving equipment, to train local staff to handle diving boats and to interact with divers. What you have done is admirable. But, because nothing is perfect, some tiny things could be improved. For example, more pre-dive briefing would have been appreciated, with underwater maps and possible currents. Also, the equipment didn’t seem very well serviced : during one of my dives, I felt water in my mouth at 20m depth and had to switch to the octopus. Also, the boat’s engine was acting funny for a long time. At some point, we had to cancel a far away dive because of it. Bottom line, we had an amazing experience for our first diving trip. We have Githa, Marcel and especially River to thank for. And because I don’t have enough experience in other sites, I know that I should appreciate it even more. Thanks for every thing, we will certainly be back ! So, does the dive shop has wet suit? or not? They don’t, Baozhen Song. You would need to bring your own. Thanks Githa – we’ve updated your page to include that info. Please do just flick us an email if anything on your page ever needs updating. I loved everything about diving with Githa. It’s not only that I felt safe and good taken care of (almost everyone else in my group was at least a dive master if not an instructor) it was also about the good vibes. The whole crew is always in a good mood, helpful and nice. I can only recommend diving with them. hope to see u again next time and dive together with mantas ! I can only say that i am utterly disappointed with their level of service. Githa and Marsel are both nice and friendly people but this shouldn’t be confused with their level of service. Githa wasn’t around on the first two days of my dive and i had to constantly push Marsel to take us out to dive trips and go to Pianemo. We were lied to blatantly that the weather was bad on our 2nd day when we were supposed to go Pianemo, however with my many years of diving i could tell we had fantastic weather and calm waves on that day. After being caught lying, we were reluctantly brought to Pianemo. We had to push for Pianemo because other guests had missed Pianemo before due to bad weather, lo and behold, the weather on our last day was horrendous. Another matter was that we were asked to pay up on our first day, which to me was a shocker. After being explained that Githa needed the money, we paid up anyway. However finding Marsel to pay itself was a hassle, went twice but couldn’t find him. End up he had to disturb us twice during dinner and before bedtime to pay up which i felt was inappropriate. We didn’t get to do the night dive that we were promised on the first day with a lame final excuse that they didn’t charged their dive torch (In actual fact they had a dinner party). I had magical dives with other homestays at Gam island and decided to come here as a closer place to dive in Pianemo. However the magic of Raja Ampat seems to have vanished here together with Arborek Dive Shop. U guys can understand Bahasa rite ? If there any accident coz the weather…? Local people know the area better than me or even u. You are also speak Indonesia rite. U can speak with marsel and boat crew…which is only one day i was with u, but boat crew, and other diver not happy with your attitude (sorry about this). Because u never talk with them. Probably u should learn if u wants to dives with local dives shop about respecting local people. Then please be honest to all of us..
We ask u about payment then u said ok. But now why your statement showed that looks like we push u guys to do the payment. If u arent happy with that. To be honest i can give your money back. Our dive shop trie to do the best for our customers but also for community. We tried to be friends for all our customers. About didnt do any night dive. Electricity on our village isnt stabile, we though its charged but not 100% charged. We wants to do night dives, but we didnt wants to make u dissapointed the torch will on and off. Why u didnt complaint to us when dinners happend. U know what happend on the dinner ?. We have traditional proposal night. After u guys left, other divers coming and join the dinner. We still can do the night dibe if u wants but we can see your face always flat and never showing anything happy. Thanks GOD we never have any complaint about our services before even from the other divers that are same time diving with u guys. So, please lets learn, and ask your self are u guys respect us and tried to be honest. Oh thats ok. No problem. We ask about diving. U said. Thank u so much. Sorry to reply everythings here, please be honest for everything that you wrote and review..
Its give impact not only to us, but the most important local people whom also work with us. Thank you and anyway i tried to replied by whatsapp i think u blocked my whatsapp. Better talk with us first before u posted. Thanks for letting us know about ADS’ website – they’ve let their domain registration expire! It doesn’t really matter which dive center you dive with: They all dive the same sites and all should take your experience and skill level into account when planning dives. Tides and currents can be strong everywhere in Raja Ampat, but good operators will dive at the appropriate times. 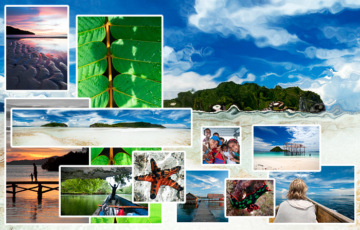 You can find all dive operators and some general Raja Ampat safety advice on this page. Maaf mba, mau tanya utk cost yg dikeluarkan selama 7hr brp yah? Trus mbak nya sendirian atau b2 sm temen atau gimana? Rencana saya maret akhir pengen ke arborek jg, thx.. atau boleh mnta kontak whats up nya? I was diving for 4 days with Arborek Dive Shop and I loved it. Githa is a very nice person, from the moment we discussed on whatsapp to see how to organize our stay, she helped us find accomodation on Arborek and made everything for us to feel good on Arborek ! Marsel is a very good dive guide and both of them are small critters lovers; they spotted a huge number of small nudibranches and even an ornated ghost pipefish. They know the area very well. Even though it wasn’t manta rays season Marsel managed to bring us at the right spot/ right time to see one! We also went together to Piayenemo, very well organised and beautiful diving ! thank you so much Elvina for your review. so apreciated. glad you happy for the presentation and the coral discussions. well we are waiting for you to coming back and dancing with mantas ! Maaf mbak, mau tanya pengeluaran selama 4hr di arborek berikut diving brp yah? Boleh minta kontak whatsup nya mbak ga mau tanya2 soalnya bulan maret akhir ada rencana mau kesana jg. Thx..
Read all Paula said below! I could not say it better. The best diveshop/divecenter in Raja Ampat I had ability to try! )I was there i January 2017). Githa and Marsel are awesome diveinstructors and know a lot of divespots around Arborek, fascinating! Arborek is close to a lot of amazing divespots and is really near divespot Manta Sandy/Manta Slope. They are listening to what you like to see and where you want to go diving. They are also really friendly and welcoming, I really enjoyed to bee around them and the diveshop. Good english speaking, good organised and you get a lot of information. 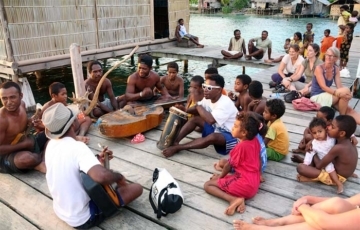 My impression is that the diveshop and the people living in the village at Arborek working together for a sustainable future for the village and the marine nature reserve in Raja Ampat, the best thing to keep this paradise alive forever. I highly recommend to go diving with them and I if I go back to Raja Ampat I will go dive with them again! During my second visit to Raja Ampat in July, I did one dive with Arborek Dive shop after Ghita told me there are secret dive sites near Arborek besides the very popular Cap Kri, Blue magic, Sardin/Chicken reef. I spent 4 awesome days with these two and loved every moment! not only did I make a life long friend (Githa), but I got to dive in some of Arborek’s and Raja Ampats best dive sites! Both Marcel and Githa went above and beyond to take me diving over New Years Eve, fitting in 7 or 8 dives in over 3 days (being NYE, NYD and 2nd Jan)! We also hired a speed boat and went on an adventure out to Piyanimo, Fam and did some awesome dives at Melissa’s Garden, Galaxy and Lagoon. Arborek is definitely a place you will instantly fall in love with and never want to leave and diving with Arborek Dive Shop defiantly makes you want to quit life and move to Arborek to go diving every day with this amazing couple!